April 26th is National Kids and Pets Day! National Kids and Pets Day is a fun day to celebrate the special bond that is held between our pets and kids. It also reminds us what pets can teach our children as they grow up. RESPONSIBILITY: If your child is old enough to get involved with activities taking care of your pet, let her help! She can fill the water bowl, brush the fur, or help pick up the pet toys. As she grows older, she can assist with the feeding schedule, clean up feces from the yard, and even help with training. 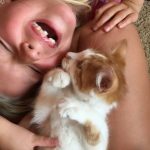 COMPASSION: The compassion and nurturing that a child can learn from a pet will extend to other people as they grow, and even to their own kids one day. HEALTH: In a world where technology is king, having pets can be a positive distraction from our devices. It’s also a great way to encourage the kids to get outside more! SOCIAL: A pet can help teach a child social skills and build their confidence. Is your child learning how to read? Have her read a story to the cat! What’s better than having a best friend to talk to who will never judge you? SAFETY: A pet helps teach our kids how to be safe with animals. As parents, it’s our responsibility to teach our kids how to interact with animals appropriately and always supervise their interactions. If you meet a new dog on a walk, does your child know to ask permission first before petting? Thinking about adding a furry companion to your family? Consider adoption first.